President Barack Obama, speaking alongside Argentina’s President Mauricio Macri, paid tribute to victims of Argentina’s “Dirty War” on Thursday and promised the declassification of U.S. files related to it. 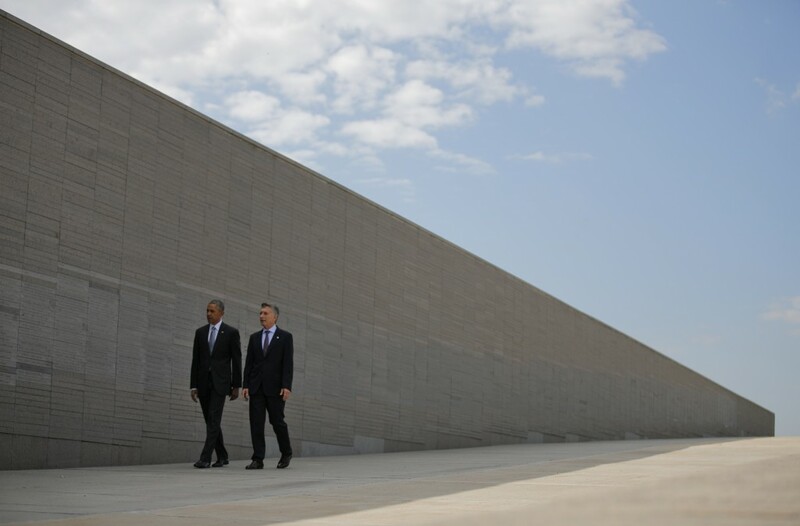 Forty years to the day after a 1976 coup opened a period of military rule in Argentina, Obama paid tribute to the victims of Argentina’s “Dirty War” by visiting Remembrance Park and tossing a wreath into the river water near a memorial bearing thousands of names. Addressing a small audience afterward, Obama said it takes courage for a society to address “uncomfortable truths” about its past. But he said that while doing so can be divisive and frustrating, it is essential to moving forward. “We’ve been slow to speak out for human rights and that was the case here,” Obama said, standing alongside Argentina’s new president, Mauricio Macri. Obama said his administration will endeavor to make amends by declassifying even more documents that could shed light on what role the U.S. may have played in one of the region’s most repressive dictatorships. Thousands of documents were declassified in 2002, but Obama has said he will also declassify military and intelligence papers for the first time. “I believe we have a responsibility to confront the past with honesty and transparency,” he said. Though much remains unknown, rights groups believe U.S. backing for authoritarian regimes in Latin America extended to Argentina during the 1976 to 1983 period known as the “Dirty War.” As controversy mounted ahead of Obama’s visit, he announced the promised declassification was at Macri’s request. Yet that step hasn’t quelled concerns. Even as Obama met with Macri on Wednesday, protesters gathered in Buenos Aires to protest his visit, while some prominent rights groups boycotted Obama’s visit to Remembrance Park. A large march also was planned Thursday afternoon to commemorate the 40th anniversary of the coup. Macri thanked Obama for visiting “on this very special day for us” and called for a renewed commitment to democracy and human rights. “Every day, somewhere in the world, they are jeopardized,” he said in Spanish. For his part, Macri has been criticized for de-emphasizing the need for U.S. accountability as he pursues closer ties with Washington. He declined Wednesday to say what he expects the records will reveal. Some 13,000 people were killed or disappeared during the “Dirty War,” Argentina’s government estimates. Rights groups put the number closer to 30,000. Obama was closing his two-day visit to Argentina by spending Thursday afternoon with his family in Bariloche, a picturesque city in southern Argentina, before departing for Washington.